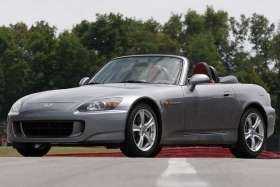 A favorite of enthusiasts, the S2000, appears to be on the chopping block. In the United States, Hondas sales fell 8 percent last year and fell 35 percent in December. Tough times have led to the demise of the NSX supercar program, which would have had a front-mounted V10 and was to be a 2010 model. Now, Honda also has decided to shelve a rear-drive V8-powered BMW-fighting Acura that was due in 2015, according to Autocar. The V8 -- long a sticky issue with Hondas green image -- was seen as the wrong powerplant, given the widely fluctuating price of fuel. The Japanese automaker remains doubled-down on hybrids with a slew of them, including the new Insight due in the spring. Honda also sees diesel power as the best short-term option for larger vehicles.